The Go4Europe Conference was held in Tel Aviv Monday to support business cooperation between Israel and Europe. 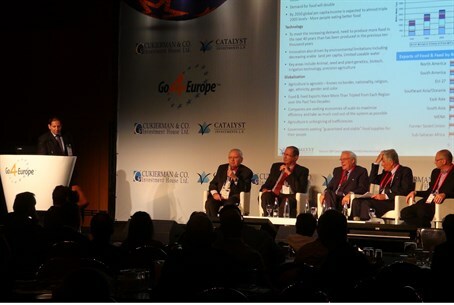 On Monday Go4Europe, on of the most prestigious business conferences in Israel, was held at the Tel Aviv Hilton Hotel. The conference, which began in 1993 and is organized by Cukierman Investment House Ltd. and Catalyst Fund, placed an emphasis on the high-tech industry, life sciences and green energy. Haggai Ravid, CEO of Cukierman Investment House, noted the turnout to the event was more than a thousand people, with a large showing from Russia, China and India in addition to the usual Israeli and European attendees. Last year the conference was notable in attracting the presence of top Chinese business leaders. French Businessman Maurice Levy praised Israel's developments, and remarked that the event shows the nation's growing attraction in international eyes in various fields. Ravid remarked that many Europeans look at Israel as a model, given the nation's success in being a developed country that continues to grow economically all while having very low unemployment. He further noted Israel has more money invested in start-ups than all of Europe combined. Adir Zimerman, the CEO of start-up company Screemo, related his company's success at breaking into the American and European market with its innovative technology.